94 High Street in the 1920s. Ambulance used by Nantyglo and Blaina District Hospital, 1940s. Blaina Central Boys' School, 1920s? Blaina High Street circa 1910. Blaina High Street in the late 1940s or early 1950s. Blaina Reading Institute and Library Billiard Team? Demolition of the Wesleyan Chapel in the 1970s. Ebenezer Chapel School Walks, Alexander Street. Edwin Morris, Archbishop of Wales at Holy Trinity Church, Nantyglo. End house of River Row Steps leading to Church Street, Blaina. Garnfach Methodist Church. Built 1883 closed 21st October 1991. Plaques displayed in Church. General View Blaina. Taken from Westside. Henwain Row , Demolished in mountain landslide. Also Henwain Pit. General View from the West, Blaina. Backs of Victoria Street, Gas Works, Railways Station, Lower Deep Pit. Hafod y ddol Grammar School Hocket Team, Season 1942 to 1943. Hareb Chapel Built in 1819 at Caban Gwyn Nantyglo for £111. By 1825 the chapel became too small for the congregation and moved to the new chapel Rehobeth in Brynmawr. Hermon Welsh Baptist Church, Nantyglo. Holy Trinity Church Nantyglo. Built by Crawshay Bailey. 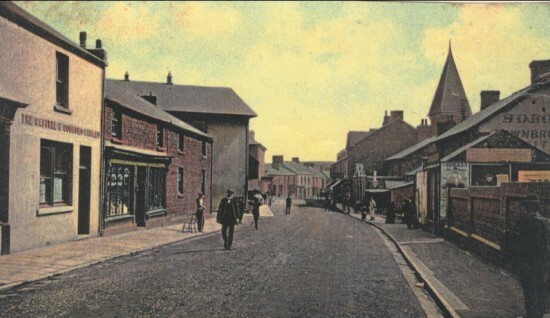 Liptons Shop in about 1910. Memorial plaques at Ebenezer Chapel, Blaina. Royal Gwent Glee PartyBack Row 2nd left, Parry Jones. Middle Row far right ,George Price, went to USA. Standing are George Aubrey and his wife Jane (Price). They lived at Victoria Street at this time, but later lived at the Rectory at West Side. The couple that are seated are unknown. The new Spiritualist Hut, Cwmcelyn Road, Blaina. Original hut was a zinc shed. The old Vicarage, which has been converted into a social club for Semtex employees.